I bless you in the darkness, I bless you in the day. I bless in the sunshine, for love is here to stay. I bless you in the spring time. I bless you in the fall. I bless you in the cursing, of those who forget to call. I bless you in the sweetness that grows inside of you. I bless you the heavens, for blue is sacred true. I bless you while you are dancing. I bless you in my heart. I bless you in the beginning, when you make a sacred part. I bless you in the morning, the day that flows to you. I bless you in the evening the dusk returns home to you. I bless you in the footsteps that take you close to me. I bless you in the flying, that strives to receive. I bless you in the waste lands, to bring emptiness a home a valley full of flowers, under a sun. I bless you in the beginning of man's sacred thought, I must bless others, in order for me to stop. I bless the peace upon me, when I go through all the hoops. I bless the sacred harmony, that brings me close to me. I bless the Chippewapa (rainbow river in the sky), who clings to love each day. I bless the harmony of her play. I bless the ceilings where ever the sky is long. I bless the forever harmony that grieves under the sun. I bless the sacred darkness, under the feet we cling, to the roots of heaven inside the land we loom. I bless the waking hours, the nighttime when I dream. I bless the snake who relieves me, because I really need. I bless the sails that ponder upon all the shores. I bless the nails that bind us to all the doors. I bless the heavenly moon light, that lifts me like a cloud. I bless the heaven sent, it's out loud. Thunder of the blue road, the heart of this las. The waking of harmony, is a blast. I bless each sting she gifts out past. 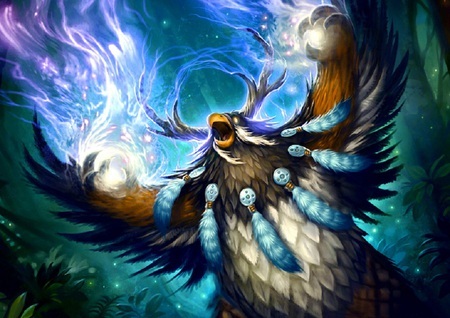 (shout out) I bless you, I bless you, Sacred nine come to thee. I bless you forever and on my sacred knees. Bow down to harmony! Chippewapa means "Rainbow River in the Sky". She is a blue child and heart of the world. Her rainbow colors are blue, magenta, aqua and gray. Rainbows are created inside of Thunder that Flies! She brings us happiness because she calls, the blue of heaven upon this view. And Rainbow Colors fly into the sky, to heal all of our lives. And when we are in tears and need a helping hand, there begins a dance in the wind. And we begin to muster the strength that we need, to lean on love in the wind. Come shout and dance and bring your thoughts to God (voice) where the wind will listen to all your pain. And when are done sharing the story upon your heart, the step in your dance will feel the wind. We gather to show the great mystery show, the spirit that relies on everything. It's you and me Brother, my Sister I do k/need, because we are part of this sacred tree. The holy devoted, the true and motivated, to gain love is known in our hearts. And those who don't look forth, but only look back of course, you miss the adventure waiting to begin. It's smooth sailing when heaven is a whaling, down the valleys into darkness, where our soul do appear, to shout out, we are sow near (rainbow colors stream from our hearts). White Buffalo Calf Woman Sings the Blessing for Chippewapa during the floods across the plains, rivers over flow, to open all the doors, heaven is coming home! I Danced for You in the Light! Aho this day and they day before I danced for you in the light, it was darkness and night and my dreams did take flight. It was through love that I began to understand and I danced with others hand in hand. We sat with the Elder on a solar plane together we did share. Today I come with a message to prepare for the Elders will soon come to be with us here. Today I sing from the heavens not be in fear we are apart of all as all is a part of us. 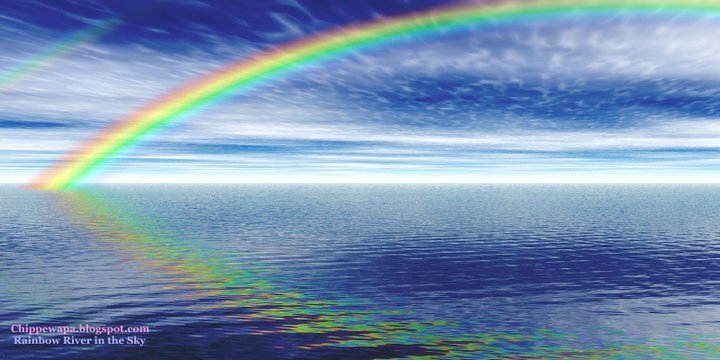 Today and the coming days remember to arch and bow like a rainbow. Dance and swim in the rivers of your colors. Joy and love you shall feel. Hoop 4: Teach what is right, that law is the LOVE, then when two hearts is united, we share with intelligence. However if LOVE doesn't lead the way, then we fight to unite LOVE, two broken hearts, then we know that we are walking the truth path, the love to each other, the kind that lasts, over rolling hills in time, over the suns, and into the heart of the blue seas of everyone. We are the Prophecy, the Rain upon the Land, so parched, it will need a Rainbow, to serve it home the right way and know where to land (the Rainbow always lands on the pot of gold, abundance, brotherhood)! Have you thought the song went wrong or dew you cling to you? The red road is near, we must not fear, but walk towards all that goes wrong, because it's when we beat the trumpet horn, the birds begin to bee, the great spirit that we need. Awake to billiards (pool, blue waters) where balls do crash upon the open masks. Tear out your heart and know it's part of the winds that we bear, the stars who are lost in their stare. Oh stars that shine sow bright, help alleviate the plight. For heaven is near without these tears, fill me up with gushing springs of love, then I can feel heaven's blooming hands, dig deep into fertile soils. There the green grass does grow, on top of my head (hair flows), I dew bare, the signs of love, God gifted above, to rain down whispers in the snow (crystalline). We are on our way, waves show! White Buffalo Calf Woman glows, to shed a hand of tears, pour down upon the rainbow sun, where billows of calves do appear, the babes who know no fear! Chippewapa means "Rainbow River in the Sky". She is a blue child and heart of the world. She brings us happiness because she calls, the blue of heaven upon this view. And Rainbow Colors fly into the sky, to heal all of our lives. And when we are in tears and need a helping hand, there begins a dance in the wind. And we begin to muster the strength that we need, to lean on love in the wind. Come shout and dance and bring your thoughts to God (voice) where the wind will listen to all your pain. And when are done sharing the story upon your heart, the step in your dance will feel the wind. We gather to show the great mystery show, the spirit that relies on everything. It's you and me Brother, my Sister I do k/need, because we are part of this sacred tree. The holy devoted, the true and motivated, to gain love is known in our hearts. And those who don't look forth, but only look back of course, you miss the adventure waiting to begin. It's smooth sailing when heaven is a whaling, down the valleys into darkness, where our soul do appear, to shout out, we are sow near (rainbow colors stream from our hearts). It happened while in dream state. I was taken from my bed in sleeping state, only to be lead into a land or space in time or dimension, a place where the animals were talking to me. It was rather shocking at first but as time went by I began to remember parts of my dream. Some important messages were as follows. Rabbit was tired of being a vacuum on the forest floor. Skunk however was the little warrior. Deer told me a very important message I will not forget. 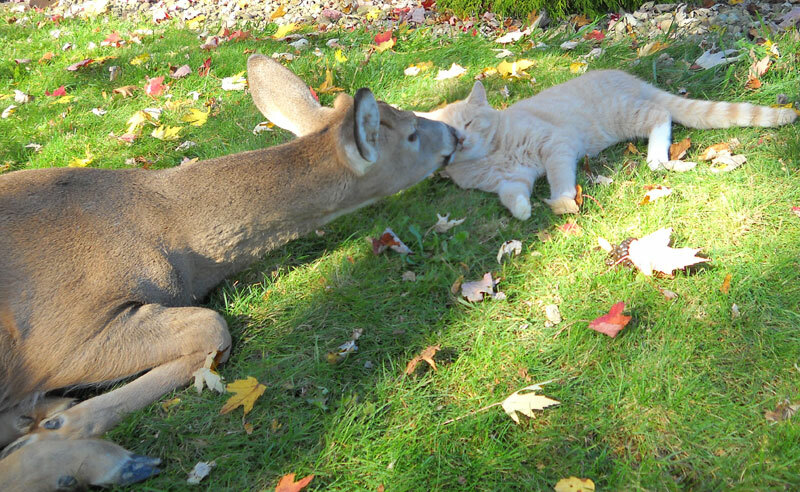 Deer had told me that "they, the animals, understand us better than we understand ourselves". I examined this statement and I come to the conclusion that deer was right. This statement rings true to those who are not awaken yet, in which accounts for (I am guessing) 75% of the worlds entire population. As I was in my first cycle of evolution, this dream came about. It did make a great deal of sense (to me). I began to look at myself, trying to see myself through their eyes. They are right and I was reminded. It is true what (White Buffalo Calf Woman) Twin Deer Mother says, the animals are pure. And they are watching us. I took these messages to heart and this is why I share this with you all. 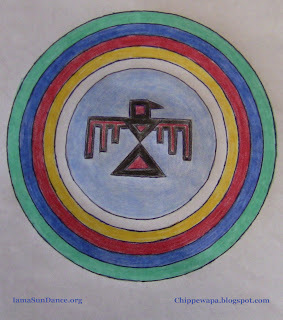 Aho (may your spirit fly) I bow and bless the nine sacred directions. Aho! 1. Rabbit cleanses others. They must communicate and stand in the middle of disputes and resolve them with their almost deceptive qualities. They are good a white lies (small untruths or deceptions meant not to harm others, or leaving out the truth), in order to bring opposing views together, to gather and discuss important matters. They are tired of dealing with disputes, instead of gifting the loving embrace and warm they prefer to gift to the world. Rabbit says, "Chin up. Honor thyself." One more thing, the Cat and Rabbit share an important feature, the ability to jump high without any effort. 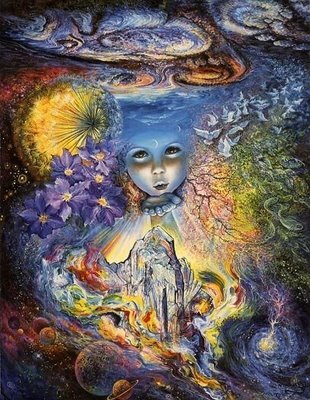 This means, they can feel the flowing crystalline stone stream of our dreams and talk it out for us to be cleansed/united in hearts. 3. 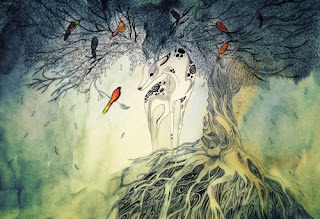 Deer Branches and Divides to guide, like a tree of life. Deer are always ahead of the streaming. Often running towards the rolling hills, gifting their love a wave. 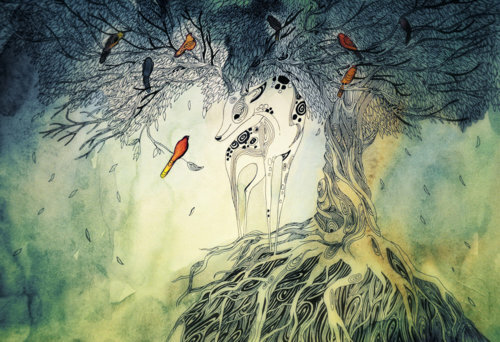 "Come tell me a story, then you will know how to make it grow", the Deer will say. Your heart and your kneeds/needs come first. I will push you, guide you, provide for you, gift to you and then die for you. This is the relative who shows you where the roads live, "Inside your heart, let us dart (aim like an arrow), to see the sky and rivers swim. 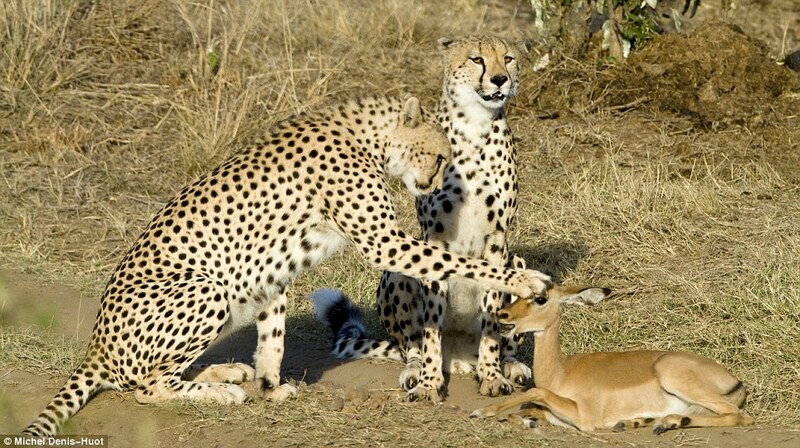 Let us share a den". Rabbits are vegetarians. Though they are eating, they are always alert. They eat the inner bark of saplings and shrubs as well as leaves and fruit, giving a perfect illustration of Nature's balance. Their rapid rate of reproduction is balanced out by the fact that almost every predatory animal eats them. This power animal may be asking you to examine the kinds of foods you eat. Perhaps a vegetarian diet, only for a short time, can help you strengthen and heal. 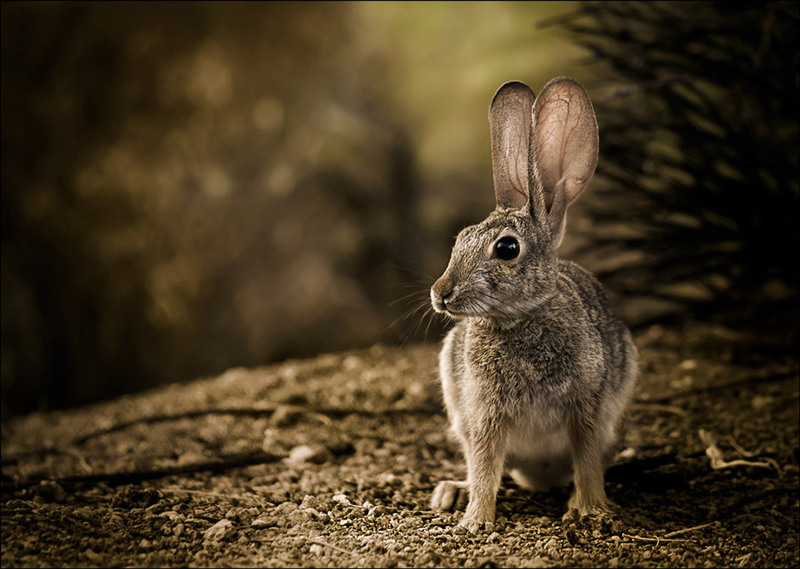 Generally rabbits are most likely to be seen between dawn and dusk. The sun rising and setting from horizon to horizon has an air of mystery surrounding it. 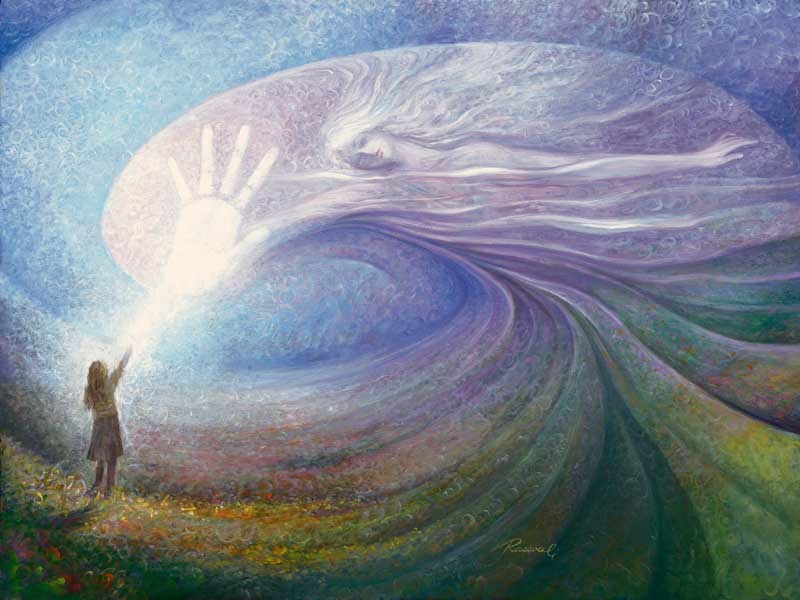 This is the time when the invisible becomes visible and nature spirits are more distinct. 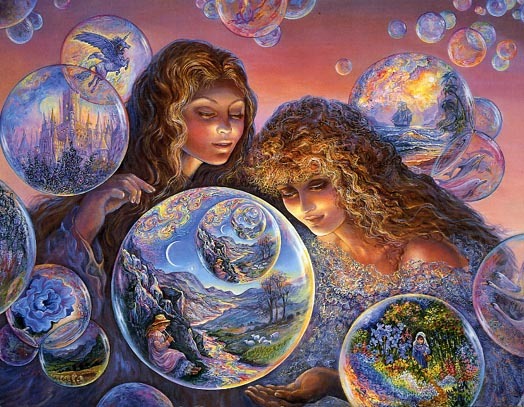 Due to the rabbit and the fairy realms being active at the same time of day, rabbit has a strong link with the magic and mystery of other worlds. To enter these worlds requires but a leap of faith. Rabbits are highly sensitive with keen observational skills, granting them strong reflexes that help them dash to safety. In the time it takes to bat an eyelid, they can be seen, disappear and reappear. Fast, agile and clever, they teach us spontaneous decisive movement, always knowing which direction to go and when. When rabbit appears, this may help us to grasp an opportunity that may only present itself for brief moments. We are able to realize what a good teacher Rabbit is in showing us that we are the creators of our lives with our thoughts and emotions. Rabbit feels fear and projects it, creating in the external world situations reflecting the inner world of fear. For us, this is an important lesson. Affirmations, involve focusing on what you want in life and positive outcomes. Thoughts have a certain energy frequency, creating a vibration aiding them to become reality. Just as true when you think about and focus on what you don't want to happen, a lot of the time we don’t even do this on purpose we do it automatically and even subconsciously, gathering strength unknowingly. This makes it extremely necessary to bring our fears into consciousness - into the light, treating them with gentleness. Excerpts from Animal Speak by Ted Andrews. The skunk is one of the most widely recognized mammals, but it is also one of the most misunderstood. It is a very powerful totem with mystical and magical associations. Just look at how people respond to it. They show great respect for it and what it can do. This is part of what skunk teaches. It teaches how to give respect, expect respect, and demand respect. It helps you to recognize your own qualities and to assert them. The skunk does not get out of the way of any animal. It moves along at its own speed, with its own mind. It is self-assured and confident in itself. If skunk has shown up, it can be to help you with this particular aspect. It can teach you how to be more self-assured and how to assert yourself. Skunks are fearless, but they are also very peaceful. They move slowly and calmly, and they only spray as a last resort. Because they are peaceable by nature, they always give warnings before spraying. This warning involves three stages. First, it will stamp its feet and turn its back to you. Second it will raise its tail up, as the gland which sprays is located underneath it. When the third step arrives, it is usually too late. After raising the tail, the skunk will look back over its shoulder. This is to line up the correct angle for spraying. Once the skunk has seen you over its shoulder, it is too late. The skunk can spray 1245 feet with tremendous accuracy. It can repeat the spraying five to six times before it must build up again naturally. The spray is an irritating chemical. It won't kill, but it can sting the eyes and numb the senses. Sometimes a skunk can show up as a totem to teach us how to get more attention without being arrogant and irritating. Sometimes it shows up to help us deal with those people in our life who are outrageously irritating. Tomato juice is still the one thing which helps to eliminate skunk odor. 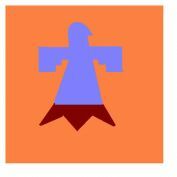 Those with this totem may find they have a sensitivity to tomato, or a need for more within their life. The qualities and characteristics of the tomato should be studied as it is part of the contrary or balancing medicine associated with the skunk. 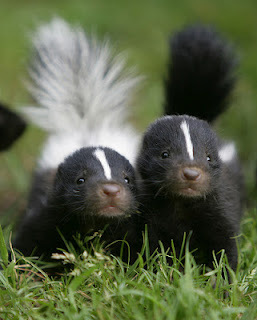 The skunk smell is one that almost everyone can recognize. This has links to how skunk awakens in others a greater recognition of you and your own abilities. The sense of smell also has ties to sensuality and sexuality. Research is currently being conducted that reveals the various connections between fragrance and sexual response. This includes work with pheromones and studies that reveal a surprising similarity between the cells of and response of the olfactory nerves, and those within the genitalia. The skunk is a solitary animal for the most part. Skunks can remind us that there are times best for drawing people and there are times best to avoid people. Finding the correct balance is what can ensure prosperity. There are two main types of skunk-spotted and striped. The striped is the most common and most easily recognized. It actually has a double stripe that runs from its head to its tail. This stripe, whether single or double, is an indication of the active flow of the kundalini or life force. (The kundalini has ties to the sexual energies and to the life force that is active in every aspect of our life processes.) In individuals with this totem, the kundalini is usually already active. Skunk shows up at a time to amplify and to teach the control and use of this life force more effectively. Skunks are usually quite silent, so it is good for those with this totem not to blow their own horns. It will backfire and only serve to push others away. Sit back and let others do the noticing for you. Skunks are very adaptable and this is what those with this totem must also learn. Skunk can teach you when its best to be noticed and how to go about it most effectively. They are carnivorous, but they will eat almost anything, particularly insects, berries, and fruit. Skunk does its hunting at night. Understanding how to "walk your talk"
"Horns pierce the heart, when you aim with love!" says White Buffalo Calf Woman your Twin Deer Mother. the animal kingdom wanting to get into heaven to see the Almighty God. At a council meeting all the animals stood up to tell why they would be the most appropriate one to get to the kingdom of God. The Bear stood up and said, " I, Bear , who is the strongest bravest creature will go to see the Creator". Upon the road to the Creator stood a big nasty, monster. The bear took one look and ran back to the animal kingdom to tell of the nasty, monster. The Eagle Screeched, "I will fly over the monster to get to see the Creator". Off went the eagle. He flew higher and higher and got closer to the kingdom of the Creator than any other animal before. He started to screech a prayer. "Almighty Great Creator, I so would like to see You". The Almighty Creator said, "It is true you are the best at reaching high enough to talk to me, but a messenger is all you will be. Tell the rest of the animals that they have to go through the red road of truth to find me". The eagle said to The Almighty Creator," But there is a monster in the way , how can we cross? The Almighty said no further. The eagle went back and told all the animals of what the Almighty had said to him. And all the animals started to fight and argue. The Deer hearing such a roar jumped so high he landed right in front of the nasty monster. The deer looked into the eyes of the monster and stared. The monster looked deep into the deer's eyes and saw love, warmth and tenderness, and upon seeing that the monster melted away. And so the deer was the first to go through the red road of truth to see the Almighty. Elk (deer family): Strength, agility, freedom, power and nobility. Celtic: The Insular Celts held deer as supernatural animals, "fairy cattle" that were herded and milked by a localised and benevolent fairy giantess (a bean sìdhe) in each district, who could shift shape to that of a red deer; in the West Highlands, she selected the individual deer that would be slain in the next day's hunt. Cernunnos was a god in Celtic mythology that possessed two deer antlers on the top of his head. He was known as The Horned One or The Horned God despite having antlers and not horns. Cernunnos is also known as The Stag Lord, The Horned God of the Hunt, The Lord of the Forest, The Lord of the Hunt, and The Lord of the Animals. Christian: In the story of Saint Hubertus, on Good Friday morning, when the faithful were crowding the churches, Hubertus sallied forth to the chase. 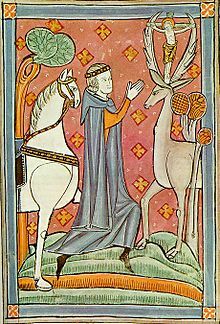 As he was pursuing a magnificent stag the animal turned and, as the pious legend narrates, he was astounded at perceiving a crucifix standing between its antlers, which occasioned the change of heart that led him to a saintly life. The story of the hart appears first in one of the later legendary hagiographies (Bibliotheca hagiographica Latina, nos. 3994-4002) and has been appropriated from the earelier legend of Saint Eustace or Placidus. Ottoman Empire: Turkic peoples that converted to Islam brought with them from the Eurasian Steppe their beliefs and cults involving horns, deer, antlers, hides, etc. (Not entirely without precedent: The pre-islamic Kaaba itself had ram’s horns mounted on its walls). In the Ottoman Empire, and more specifically in western Asia Minor and Thrace the deer cult seems to have been widespread and much alive, no doubt as a result of the meeting and mixing of Turkic with local traditions. A famous case is the 13th century holy man Geyiklü Baba, ‘Father Deer’, who lived with his deer in the mountain forests of Bursa and gave hind’s milk to a colleague. Germanic: An Anglo-Saxon royal scepter found at the Sutton Hoo burial site in England features a depiction of an upright, antlered stag. In the Old English language poem Beowulf, much of the first portion of the story focuses on events surrounding a great mead hall called Heorot, meaning "Hall of the Hart". In the Poetic Edda poem Grímnismál the four stags of Yggdrasil are described as feeding on the world tree, Yggdrasil and the poem further relates that the stag Eikþyrnir lives on top of Valhalla. In the Prose Edda book Gylfaginning, the god Freyr is having once killed Beli with an antler. In Þiðrekssaga, Sigurd is presented as having been nursed by a doe. Andy Orchard proposes a connection between the hart Eikþyrnir atop Valhalla, the hart imagery associated with Heorot, and the Sutton Hoo scepter. Sam Newton identifies both the Sutton Hoo whetstone and the hall Heorot as early English symbols of kingship. Greek: Callimachus, in his archly knowledgeable "Hymn III to Artemis", mentions the deer that drew the chariot of Artemis: in golden armor and belt, you yoked a golden chariot, bridled deer in gold. One of the Labors of Heracles was to capture the Cerynian Hind sacred to Artemis and deliver it briefly to his patron, then rededicate it to Artemis. As a hind bearing antlers was unknown in Greece, the story suggests a reindeer, which, unlike other deer, can be harnessed and whose females bear antlers. The myth relates to Hyperborea, a northern land that would be a natural habitat for reindeer. Heracles' son Telephus was exposed as an infant on the slopes of Tegea but nurtured by a doe. Hinduism: In Hindu mythology, the goddess Saraswati takes the form of a red deer called Rohit according to the Aitareya Upanishad. Saraswati is the goddess of learning so learned men use deer skin as clothing and mats to sit upon. A golden deer plays an important role in the epic Ramayana. While in exile in the forest, Rama's wife Sita sees a golden deer. Biblical Hittites: Anatolia, north-western Syria about as far south as the mouth of the Litani River (in present-day Lebanon), and eastward into upper Mesopotamia. The Hittite military made successful use of chariots. 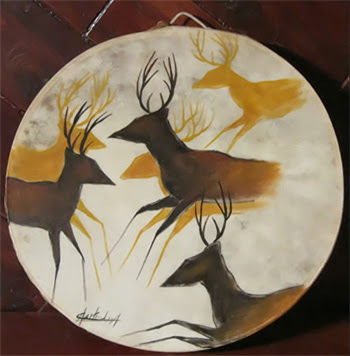 The stag was revered alongside the bull at Alaca Höyük and continued in the Hittite mythology as the protective deity whose name is recorded as dKAL. Other Hittite gods were often depicted standing on the backs of stags. Judaism: The Tribe Naftali bore a Stag on its tribal banner, and was poetically described as a Hind in the Blessing of Jacob. In Jewish mythology - as discussed in the Talmud (חולין נט ע"ב) - exists a giant kind of stag by the name "Keresh". He is said to live in a mythical forest called "Divei Ilai". Occultism: The spirit Furfur in The Goetia is depicted as a hart or winged hart (deer). 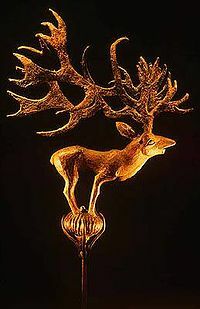 Scythian: The Scythians had some reverence for the stag, which is one of the most common motifs in their artwork, especially at funeral sites. The swift animal was believed to speed the spirits of the dead on their way, which perhaps explains the curious antlered headdresses found on horses buried at Pazyryk. Slavic: In Slavic fairytales, Golden-horned deer is a large deer with golden antlers. Huichol: For the Huichol people of Mexico, the "magical deer" represents both the power of maize to sustain the body and of the peyote cactus to feed and enlighten the spirit. Animals such as the eagle, jaguar, serpent and deer are of great importance to the Mexican indigenous cultures. For each group, however, one of these animals is of special significance and confers some of its qualities to the tribe. For the Huichol it is the deer that holds this intimate role. The character of the Huichol tends to be light, flexible and humorous. They have avoided open warfare, neither fighting against the Spanish nor Mexican governments, but holding to their own traditions. The Huichol hunt and sacrifice deer in their ceremonies. 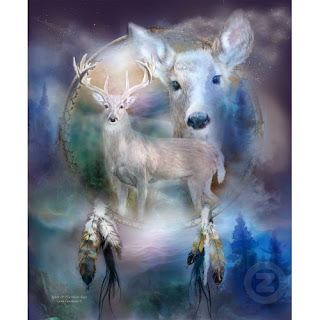 They make offerings to the Deer of the Maize to care for their crops, and to the Deer of the Peyote to bring them spiritual guidance and artistic inspiration. Shinto: Deer are considered messengers to the gods in Shinto, especially Kasuga Shrine in Nara Prefecture where a white deer had arrived from Kashima Shrine as its divine messenger. It has become a symbol of the city of Nara. Hungarian: In Hungarian mythology, Hunor and Magor, the founders of the Magyar peoples, followed a white stag. The stag lead them into a brand new land that they named Scythia. Hunor and Magor populated Scythia with their descendants the Huns and the Magyars. To this day, an important emblem in Hungary is a many-antlered stag with its head turned back over its shoulder. I gift my heart to the world. Aho (may your spirit fly). I am the spoken child that is heard. My soul does find the sky, up up higher that is why. I gift me spirit to all who calls. We are now and here and forever. My soul does sing in the clouds to be near you. I shall hear you and be near you the waking of the clowns (heyoka, medicine). Let us wake to laughter everywhere. Let us shine our hearts to be heard. 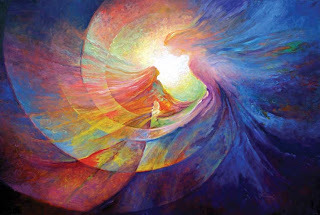 Let us become the radiance of God, from inside my heart. Let us join together and never part for we are sacred in all shape and form and we shall come with heeds (pay attention to, listen and consider) in the winds of the storm. Dine with a heart that is full (God fills me up, my soul is filled). Fear not for we are love. Let God fill my heart of gold. Fear not for now we come home, to you and me. Our souls do set the sail, for all to really wail, let tears find our hearts, to purify the roads. Heaven come into me. Shatter all that is not part of the holy breeze. Fall down to Mother Earth and gift your love. Watch high and low for love, those who are willing to bow. Their comfort will lead the way, home into our hearts. Aho, into our heart as we lead the way to green rolling hills. Aho, displayed. We are going to become a race, of shining suns (journey over waves of rainbow colors, to and fro, from heart and rainbow). Tarry do you sea, my heart feels your relief. I bow to your sun (we are on the run on the journey of life)! Aho (may your spirit fly free). Chippewapa (Rainbow Rivers in the Sky), a blue child and White Buffalo Calf Woman, a crystal child. I bow and bless the nine sacred directions and all that is sacred. I call to you my clan Rainbow warriors of prophecy. Our time is near so must be well and dear. Love is the key to prepare, now tomorrow and always we shall share. I sing from the Rainbow River in the Sky, come all now to (a place to gather together and we) shall (become greatness) and we shall fly. Open your hearts and touch one another. We are all one on these sacred hoops. Today is the day we walk. Today is the day we learn. Roll into Blue (Road). And Red (Road) maintain balance and pass with heed, shine and call out! You are all magick! Love and kindness always, aho! Crystal (flesh) Indigo (soul) Children (dream) Learn Warrior Skills with the Peaceful Wisdom Prayer! (buffalo drum begins) I sing with you today, to bring in happiness always. We sing today in play. I sing with you today, to sing in loving all the way. Aho (salutation: spirit fly). We are part of the heavenly skies (golden child rattles and goo's and ga's), a throw. Aho (spirit fly free), we sing and are together in play (golden child jumps up and down). We begin this journey as we fly away. We look into our hearts to say . . . . into the darkness of heaven and into the skies. And more and more I live up to you (golden child sits down, looking at the clouds). I am here to have a view. We are rumbling like thunder as we seek out the treasures on this fine day. Always leaning on love all the way. We are here to make things a new. We are here to play and stay on this holy day (golden child waves to and fro). And the days are very few. Little golden child sings and plays. But if we shine for eternity, the days will long to be you and me. Chippewapa smiles and rains down heavenly tears, to say, "We are one. We are family. And now all turmoil is washed away (golden child rattles and sways). Free! We are family in harmony. We come together in purity. We are radiant with glee. Together, together, one family. We are radiate to bee. We dance across the sky. Hey oh, coming out of time. We dance across the sky. Hey ho (breath your dreams). Step by step we interwine. Hey ho. Hey ho (golden child sits silently). We are pure and love surrounds. Now we are part of this sacred hill, all these thrills . . . like rainbows heaven abounds. It's just our favored sounds. We are the love that fills the air. We are crashing towards the sea of heavenly bliss, how about a kiss? Kiss indeed, is friendship with glee. We are love that fills the night breeze. No more enemies. We are the branches of the trees. Aho (spirit fly, we feel free), no more enemies. Hi ho, a way yo ho (it's the devoted rainbow). Hi you. We go. He ho (wind blows, effort always knows). I'm on my way home. Higher and higher, home we go. Yip pity two (down about you, like clothes), through all the clues (lessons turned into treasures with love as the measure, bow to the muse). Life is wonder, full of thunder just as magical as we did dream. (Chippewapa sits in the breeze listens). How we love this world, and all our heavenly beings (golden child, sways, to hear your song he says. He lifts his hands to say, hooray, to the sky above, to the valley below, to the sacred rainbow glow). Hi ho (deep breath) (golden child crosses his hands and puts them upon his heart and holds it close). We go. Hi ho (deep breath) we flow. We dance and sing, forever bring. Today was a lesson indeed. We are the song, where heaven belongs, in which will be. We the joy of God in all we abound, perfect harmony. We are the vision of all we can be seen. We are the ripples. Think upon a star, from afar, coming home to you, inside the heart that knew. Kiss me, my soul. We share love and will always stand hand in hand. Hold on to me, embrace all I know, in this giant wonderful plan. 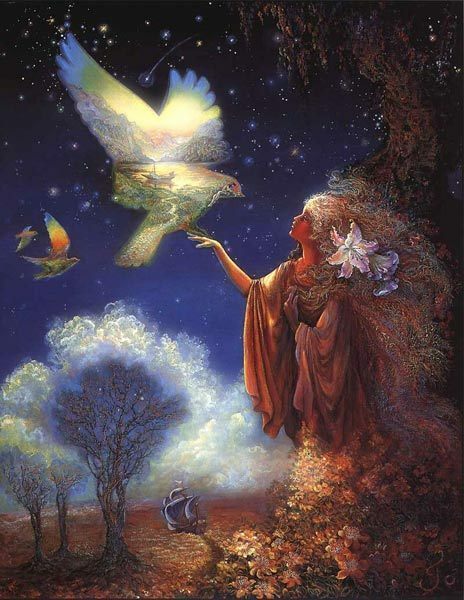 Heavenly bows in the breeze, the tree of life, always on her knees, the blessings favor all to be, a dream we share, eternally (echo the heavenly breeze all your dreams). 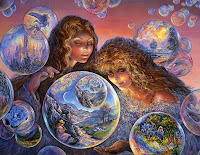 We seek the treasures this day, all who wish to dream come and play. 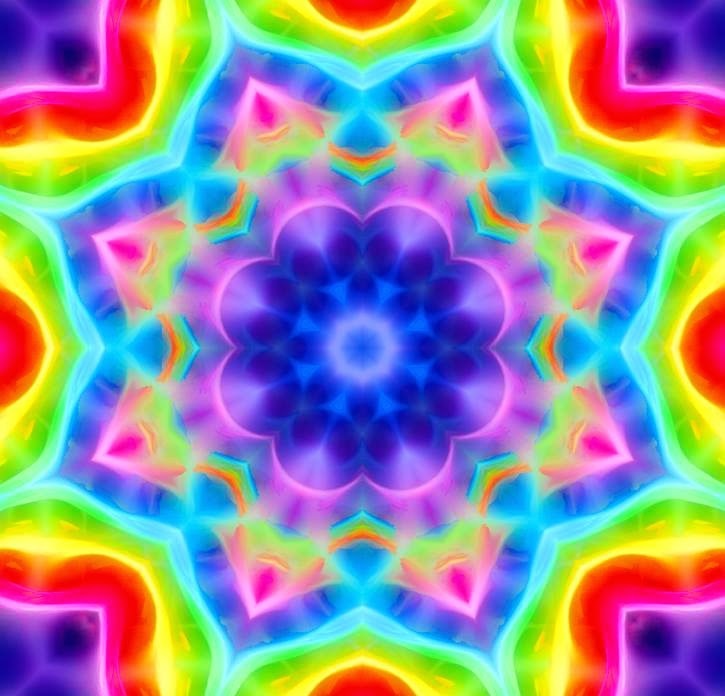 We are the rainbow and we are the colors of sweet energy, come now! Look how great you can bee (golden child wants to stand up, but a bit wabble on my lapping waves)? Little one dance. Look how wonderful it is to envision thee, golden child prances, dance in my heart (golden child starts to dance). Oh heaven is sweet when you tap on your feet. Dance in my heart. Tap your feet. Tap your feet. Move your toes. Bring heaven to your reality. Jump for joy with a smile. Be so bold, for love will lead you every mile . . . . a little while. Just for joy for awhile. Hi ho a way ya ho (flight over the rainbow). Hi ho a way ya ho (flight over the rainbow). Niya (we the people, claim the) nitasagatowin (freedom of salvation to enter into me) oma miwasin anoch (where butterfly breezes into eternity or my soul is set free) sakatowin (from the northern sky, above my head). Wa men (we). Sakatowin awasis (always looking at the sun, the place we do run, dream weaver, I am expecting you to run over rolling hills and rainbow glows, dreams fulfilled). It's the place I'm knowing. Awasisiak (time blows through us). It tu whoo (the place grows through us). Oyate (the seed of heaven). Oyate (come into me). Awasis, awasisisah ko (come brother, relative, let us go, upon the rainbow sky, where heaven is realized). Waka tanka ocinan (within the breeze, my heart will sneeze like wind, to travel over the road, my great spirit knows). Ocinan (come bring me rainbows in my heart). Hi yo hey ya ho (where it is down below, the garden of paradise). Oyate oyate, waka tanka ocia (up inside my soul, let the seed grow). Hey ho, hey hey ho (dream rainbow, down upon this world). I'm slow, watching the rainbow. Wiyo peyataka wangi (can you find hope in your dreams, unwind and begin). San hopei (a number of stories, together) everyone. Oyahgan (the place of the rising sun, the morning star) we love, we share. Ipeenee (greater than) as one (together is better than alone) in harmony under the sun, under the sun, under the sun. We are set free, opa nee (she, heavenly, who lives in me, the soul shall set me free). Come and get me. Come now bright sky. We are one together. Aho (spirit fly). Little spirits of earth sing, aho aye (my spirit rise today aye). Lift your voices to be as one as we run and holiness drums. Little spirits come grow this way (watching the green grass grow, golden child is on his belly, looking at the grass grow). Chakiyiya (where did the flow go, I must watch to catch the glow or be still my heart), cheykiyiyo (it's the place I dream to impart, share my heart), it's a mighty rainbow. Cheykiyo (come into me, sit for awhile) ahitowan (places of mercy and fire, lower heavenly red road appears) wayankeyla (holy and purified, I do walk) hey (greetings of abundance on the run), the rising sun (streams of rainbow colors). Hey yo ho (look at me go, down the rainbow). Oh keyla hey (then to rise up again, valleys of glowing showing, journey of love). Hey yo ho (I feel in my heart). Hey yo ho (I feel in my heart), it's the snow (crystalline stones, blessed rocks, each rainbow child, as we are each from the rainbow clan), rainbow stars. Come shine up inside of me. Find that far star and light it inside my breeze. Bring me home to my soul, to the place, I know that flows. I am going home, to all my dreams. Hey ho (here I go) . . . . . . . . . . . . . hey ee ho (skip to and fro). . . . . . . . . . . . ah (heavenly knows, knew, new, grew). Hey hoe (down I go, to step with the beat, my heart that awakens after sleep). . . . . . . . . . . . we are on the stone. We are on the stone (each a crystalline form, the sacred blessings, hold us to come along, the journey of the rainbow stars). Going to go to stone river and be a mighty river that flows with tears of over joy (flowing tears). Galaxy flow in me. Over joy. (aho ahi chippewapa going into daze, she feels the breeze and harmony come over she/soul, grandmother dreams) (golden child sits up, he rattles) Aho! Aho for all to sea (like a galaxy round and round). Chippewapa (Rainbow River in the Sky, Dakota/Cree) and White Buffalo Calf Woman (Lakota) sing together today, with Holiness David Running Eagle Shooting Star (Dakota) drumming for us, our song of prayer, a sacred song blessing. We bless you. We also had the Golden Child join us with a rattle. We hope you all enjoy today's prayer. There are various plain dialects, today we share our hearts for you! Let the winds blow, right down upon the Rainbow Clan. 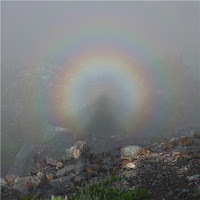 Aho, relatives of the Snow, crystalline rainbow. White Buffalo Calf Woman chats: Thank you Chippewapa, Golden Child, Holiness David who drums awhile. Heavenly astounds. Chippewapa chats: Aho. Feeling light headed, need to touch ground. Smiles. Giggles. Aho, wow body feels funny. Laughs. Aho. White Buffalo Calf Woman chats: Holiness David had to pat the golden child on the head before he was taken away. How wonderful you feel. Yes, we are so happy too. Chippewapa chats: Milky way galaxy and spinning round and round. What a ride! Awesome. Sho (lord of the skies), aho (I flow open wide, spirit flies). 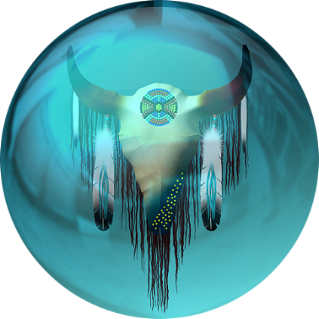 White Buffalo Calf Woman chats: We are all learning to spin around and bring it hear to sound, validate all and astound, be the heavenly blue, that rescues the new born child (the soul that awakens in you). 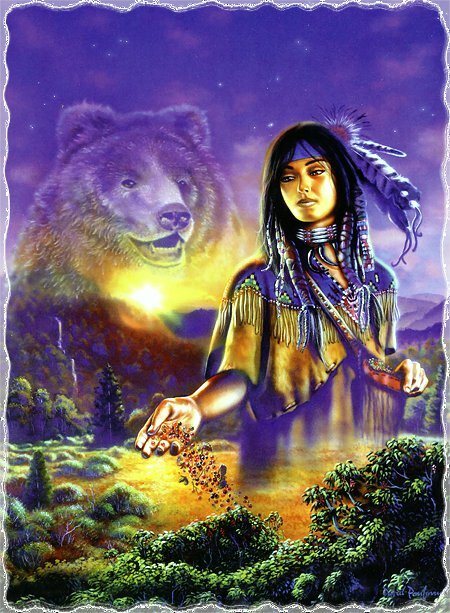 White Buffalo Calf Woman chats: The dreamer. Chippewapa chats: Aho the dreamer. White Buffalo Calf Woman chats: Aho my love and will talk to you sooner, than later. Chippewapa chats: Aho. Okay, coming back to body. Where'd we go? White Buffalo Calf Woman chats: You are funny, how wonderful you abound. Holiness and I bid you adeiu by sending love and blessings the nine sacred directions, we bow down (to you). Wow, Morning Star, Morning Star open my heart, explode with great light, to gift us all inner sight, a Rainbow delight. Thank you Grandmother Walks on Stones. Your devoted grandchild, White Buffalo Calf Woman groans (such a long path), wishing everyone could know this burn, star bright star light, gift me a rainbow sight! It is the Song of Angels that bring us home, into the Greatness that gets along. Do we need love, to rise above? Yes, bring us love that brings us all along, the laws that gets us from the rising tides, our hearts that swell and know our pride. Be that, is heard like Angels Call, we are the Rainbow Hall, where humbleness gifts life along, the path of Brotherhood. We bless the shoulders of grief befall, and send a blessings to that Great Hall, where we know tears, bring us new life, the light, that sheds all our strife. Be your color of bountifulness, the waking of the soul, that should, and we can offer wisdom here, to be the soul, that lives forever deer (journey of life). You the beloved knows good deeds, when we belong to all the leaves (relatives on the tree of life). Gifted by Alightfromwithin.Org. Theme images by RBFried. Powered by Blogger.